Parc des Sports Annecy is the home stadium of two smaller ligue 1 clubs: Évian Thonon Gaillard FC and Annecy F.C. The modest capacity of 15,660 spectators if offset by the spectacular views of the surrounding Alps, and the abundant supplies of Evian water which are probably available to buy everywhere. Parc des Sports is a multi-purpose arena which is the current home of French Football clubs Evian Thonon Gaillard FC and FC Annecy. Construction began in 1958, and was completed 6 years later with the stadium’s inaugural event being an Athletics event on 18th July 1964 between Italy and France which heralded a large part of the Parc des Sports future usage. The most notable athletics events the stadium has hosted are probably the three French Athletic Championships which were held in 1987, 1993 and 1994 with Sports Annecy also international competitions such as the World Junior Athletic Championships in 1998, the European Cup in 2002 and DécaNation 2010. 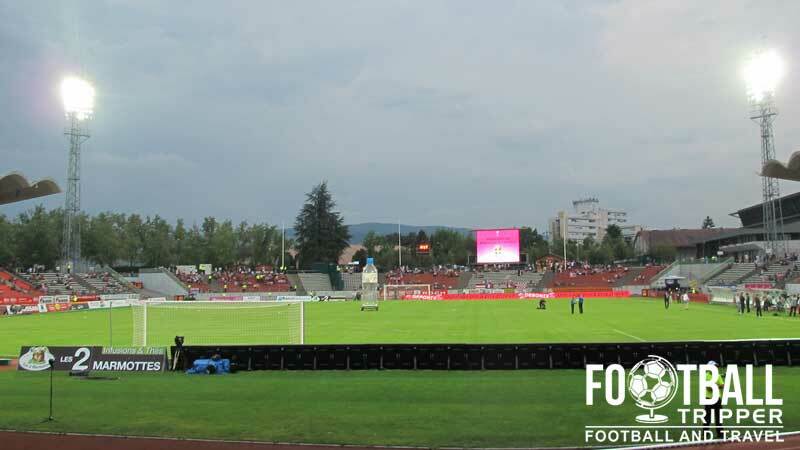 Located in the Annecy commune of Haute-Savoi, Evian FC originally played their home fixtures at Stade Joseph-Moynat but upon promotion to Ligue 2 in the 2010-2011 season, the club had to find a new home as Joseph-Moynat failed to meet the required safety standards of the division. 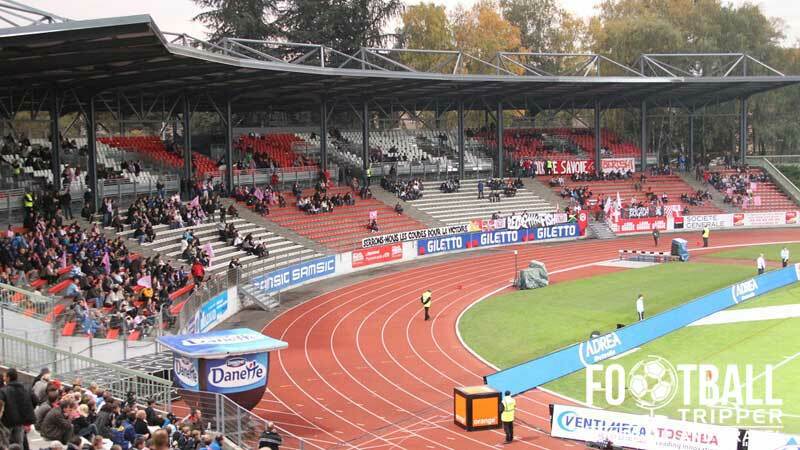 After assessing the viability of renovating their current home, they opted to temporarily share with Annecy FC and are currently exploring their future stadium options, although their preferred move to Stade de Geneve in Switzerland was rejected by UEFA. 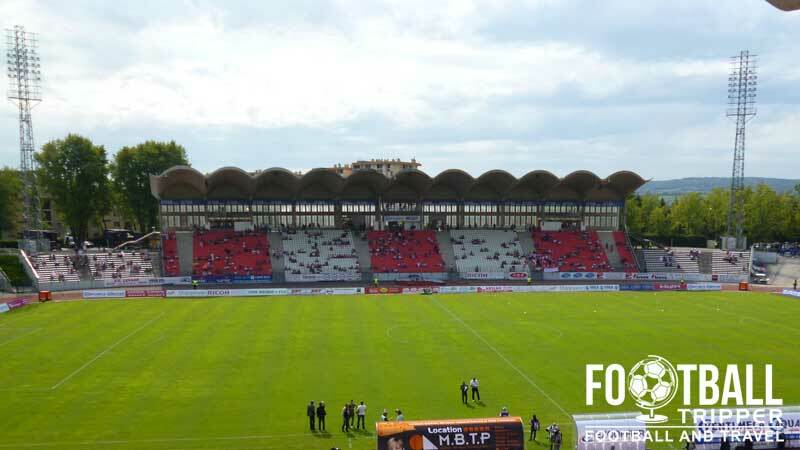 Annecy Football Club who compete in the seventh tier of French Football on the other hand are more than satisfied with the current facilities, and will be for the foreseeable future. Parc des sports is made up of four stands: Nord, Est, Sud and Oust. Evian Thonon Gaillard Football Club were formed in 2007 following a merger between Football Croix-de-Savoie and Olympique Thonon Chablais and is the only club in French football from the Pays de Savoi region. Curiously, the newly formed team was originally called Olympique Croix de Savoie and renamed to Evian Thonon Gaillard in 2009, with “Evian” referring to the famous brand of mineral water originally sourced in the nearby Evian-les-Bains spa town. As a fledgling club, Evian’s history is currently marked by a rise through the lower leagues of French football, such as winning the 2008 Savoyard club championship, followed by 2 seasons in France National Championship which they won in 2010 securing their place in Ligue 2. Remarkably and against all odds, ETG gained a back to back promotion winning the title and earning the right to move up to the top flight of French football. Asf for the other resident side, Annecy F.C’s highpoint probably came in the late 1980s when they won three promotions in nine years to reach Ligue 2, but success has eluded them since. Pink placards held aloft by the Evian tap water fans. Although you can’t see it, the views from inside the stadium are breathtaking! Away fans are housed within the Garadins Nord which is a Curva which runs behind the northen-most goal-end. The away section by default is comprised of around three blocks of seating towards the western tribune, although this can be increased depending on the levels of demand. Uncovered and exposed to the elements, the facilities within this Curva Nord are pretty rudimentary. The views from the corner also leave a lot to be desired due to the large distance between the stand and the pitch, courtesy of the unpopular athletics track. Parc Des Sports Annecy does have some decent Alpine views, and a pleasant outdoors feel to it however. The map below outlines some of the most popular Irish Pubs and Sports Bars within Annecy-le-Vieux, with the local area surprisingly having quite a lot of choice for such a relatively small town. There are a handful of dining options around Parc des Sports such as Pizzas’Choch, Le Bowl bowling alley which does American style fast food and New Delhi Specialities Indiennes which does a decent curry. On the walk back towards Le Lac D’Annecy there are plenty more options such as restaurants which specialise in the local Rhône-Alpes cuisine. Both Evian TG and Annecy FC operate club shops at Parc des Sports stadium as well as their own online stores. The main store of Evian TG is located in the city centre on 18 Avenue du Parmelan 74000, with the online store’s address being: http://www.etgfcboutique.com/. As for Annec F.C, the club lack a dedicated e-commerce website and instead offer fans of the club a online catalogue of sorts with products available to buy listed here. No reports on who the official mineral water supplier is yet. Neither team’s site suggests that a guided tour of Parc des Sports is a remote possibility and with a 15,660 capacity and construction dating back to the 1960s there really isn’t much to see. Notwithstanding the majestic Alpes mountain range of course. 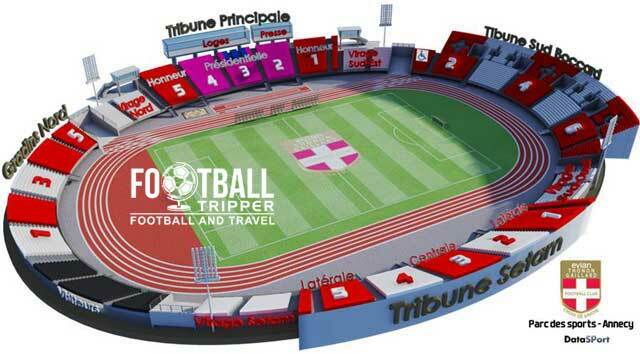 Tickets too see both Evian TG and Annecy FC can be purchased either Online, at their respective club shops or at via Francebillet and other third party vendors. Neither side completely sell out their stadium, with the more widely supported and historically more successful Evian understandably drawing larger home attendances. This means you can often stroll up to the stadium on the day of the match and watch some football but you do run the risk of either getting a poor seat or not getting a ticket at all. 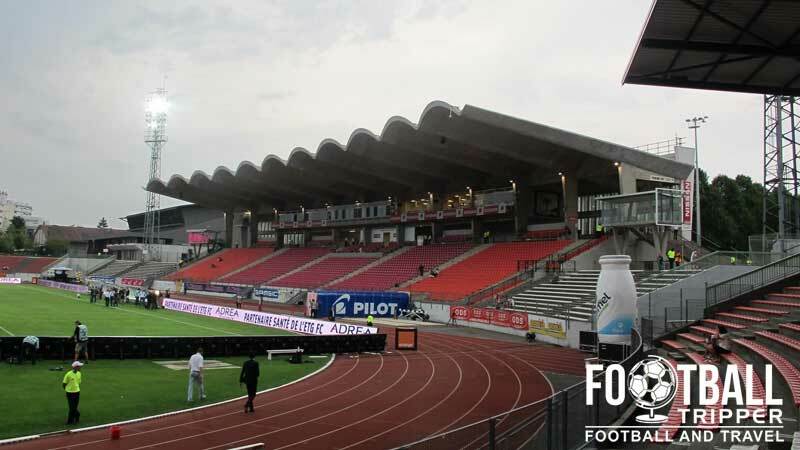 Prices to see Evian in Ligue 1 range from €13.00 for a seat behind the goal, up to €55.00 for a central seat at the main stand, with an added premium of a few euros to be expected for high-profile matches against nationally supported teams. Ticket prices for Annecy FC are considerably less as they play in the second tier of French Football. The city of Annecy is located at the Northern foot of the Alps complete with resplendent Lake. The Parc des Sports stadium is situated within the top part of the city approximately 2km away from the historic city centre and main train station. Parc des Sports Annecy on a matchday, complete with inflatable entrance gate. The town of pretty small and you could easily walk from the centre within 30 minutes if you wish to warm up before kick-off! As the Parc des Sports is on the outskirts of town it is very easy to drive to with the A41 motorway linking Annecy to both Switzerland and France. Once on this motorway take exit 16 and proceed into the city along Boulevard de la Rocde until you can see the stadium on your left hand side which will be accessible along Avenue du Stade. Parking is notoriously difficult around the Annecy Sports Park, and thus one can has written a guide to parking around the stadium her. Just follow the link, if you’re using Google Chrome it will automatically translate. Gare d’Annecy is the main railway station of the city and was first opened way back in 1866 which is a long time ago. Currently SNCF (French National Rail) operate services out of the station wit high speed routes to Paris and Geneva available. The recently added exterior of Gare de Annecy. The Rhône-Alpes region has several airports with there not being a de facto “best” – it all depends where you are travelling from and who is offering the cheapest flights. The closest is probably Geneva International Airport which is 45km North in Switzerland with Lyon-Saint Exupéry Airport being France’s answer, although it is 118km away and one hours drive away. The closest hotel to Parc des Sports is either Interhotel or Hotel Bellevue but by the time you’ve walked to these, you might as well have walked to the nicer part of town nearer the Lake. Not only is there a much better choice of hotels, you’ll have an infinitely nicer view and be close to the train station. Decently priced hotels to look at include Annecy Hôtel du Nord, Nouvel Hotel and the uninspired Best Western Hotel.